Have you ever gone to a restaurant, ordered a dish, fallen in love with it, and I thought, “I must go home and recreate this!”? That happens to me quite often. Today’s recipe was inspired by the delicious barbecue chicken nachos at Bru Burger on Mass Ave in Indianapolis. 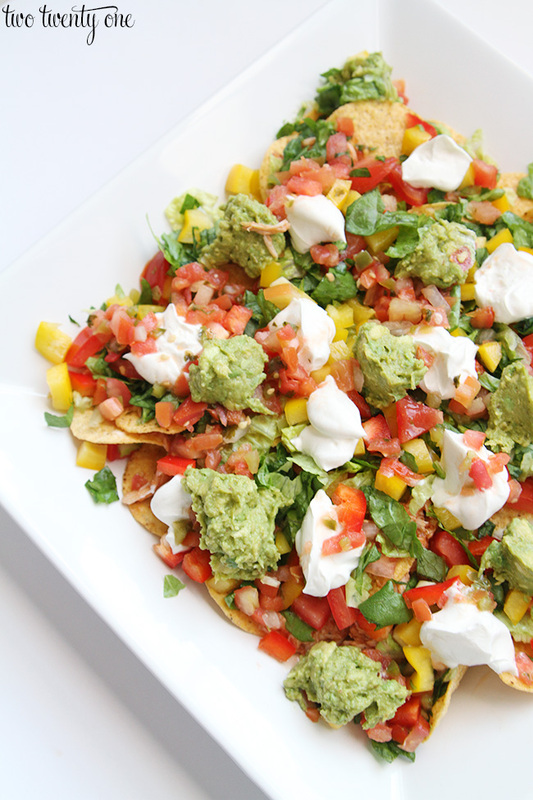 I added some ingredients to mine, but that’s the nice thing about about nachos you can pile on just about anything you like. To make the chicken, I put a couple chicken breasts in a glass Pyrex dish with some barbecue sauce (we’re Sweet Baby Ray’s people) and some red pepper flakes to spice it up a bit. Two breasts are more than enough. Sometimes I made extra and store the shredded chicken in the fridge for nachos a couple days later or for sandwiches. I bake the chicken for 25-30 minutes at 350 degrees. While the chicken is still hot, I use my trick for shredding chicken in seconds because I prefer shredded chicken over cubed chicken. Then I start piling everything on top of tortilla chips. Here’s how I layer everything: tortilla chips, queso blanco, shredded chicken, diced peppers, chopped lettuce, fresh salsa, sour cream, guacamole. We always have romaine lettuce in our house, so instead of buying shredded iceberg lettuce, I’ll chop up some of the romaine for the nachos. Make sure you’re ready to eat these immediately after putting them together because the chips start to get soggy and the cold ingredients start to cool the warm ingredients if you wait too long. I hired a hand model for this photo. Just kidding. That’s my hand. I think I have a future career in hand modeling if this whole blogging thing doesn’t pan out, don’t you think? They look delicious! I’ve been in a meal plan rut and craving more fresh recipes so I’m going to add this to my list to try. Thanks for sharing! 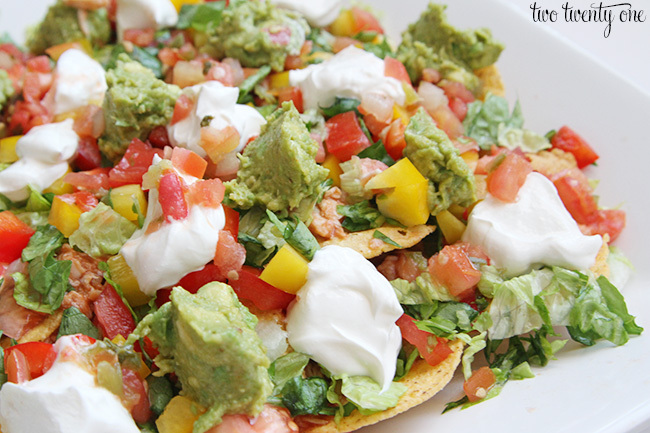 Omg now I’m craving nachos. Yum! These look amazing! Adding to my recipe list immediately. Love the tip to shred the chicken with a KitchenAid mixer. I’ve owned my mixer for almost a year but I am unsure how to use it and haven’t tried it once yet. Your post inspired me to get out the manual and figure it out. Also, I have to share – I read your post on how to organize your kitchen pantry. I bought six sterlite baskets and tackled my pantry this weekend. It looks amazing now thanks to your tips! 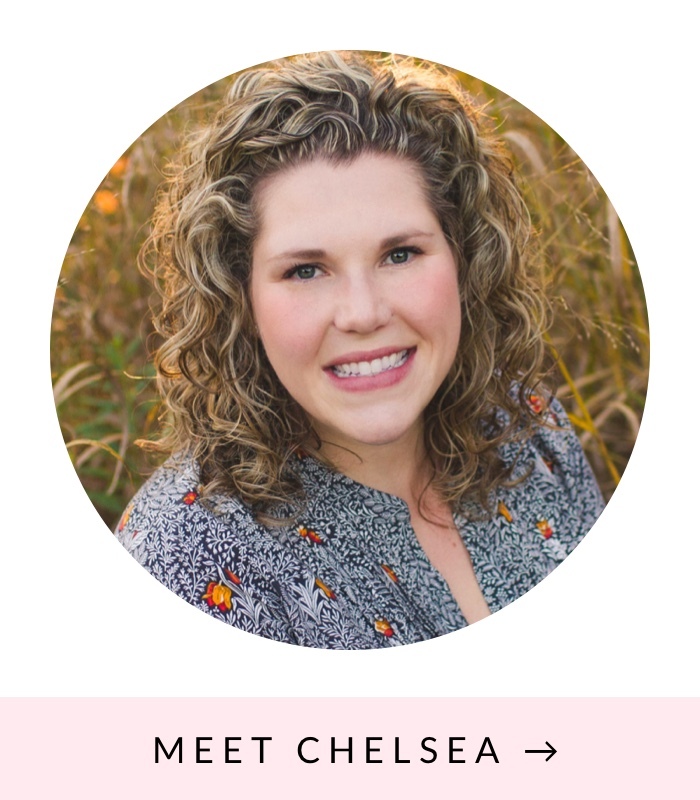 Found your blog a few months ago and I love everything you post. Thanks for the recipe. I can’t wait to try it. Also, I would have never thought to use my KitchenAid Mixer to shred chicken. Genius! These look AMAZING! I am a forever fan of any kind of nachos, but have never thought to do bbq. Can’t wait to try them! Oh, yum! 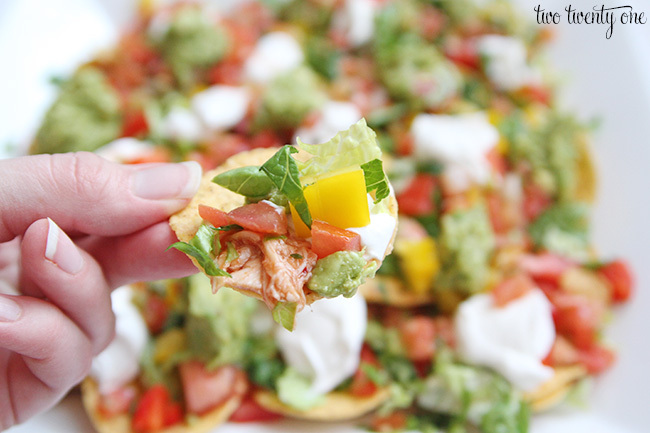 I am a big nacho lover, but haven’t ever had barbecue nachos! Thanks for the recipe- it looks delish! 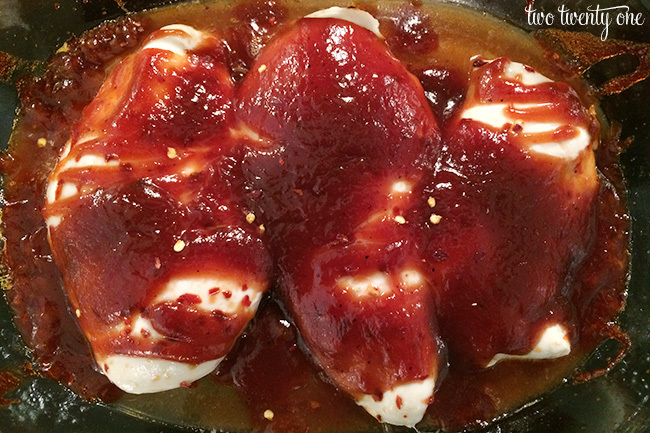 Making these right now…chicken is taking a little longer than what the recipe says. I’ll be doing individual portions. That way the whole family can make their own the way they want!! Thanks for the great recipe!! I made these for dinner tonight–SO yummy! I used Monterey Jack instead of queso blanco, and added some corn on top (leftovers from last night’s dinner). Loved it! Yum! This looks like such an easy last minute meal! These look awesome! 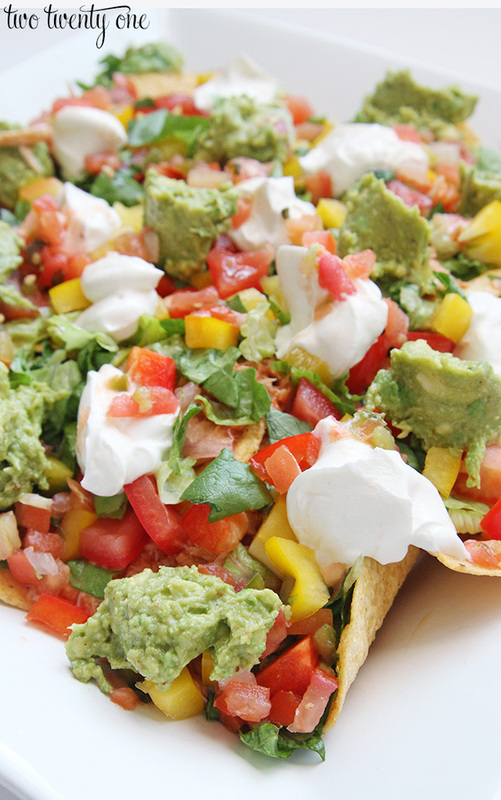 I’m seriously always up for nachos. 🙂 Thanks for sharing your recipe with us at Merry Monday this week! I know my family is all about yummy nachos. Looks so good.